← Sweets for the Opening of Anthropologie in Portland! 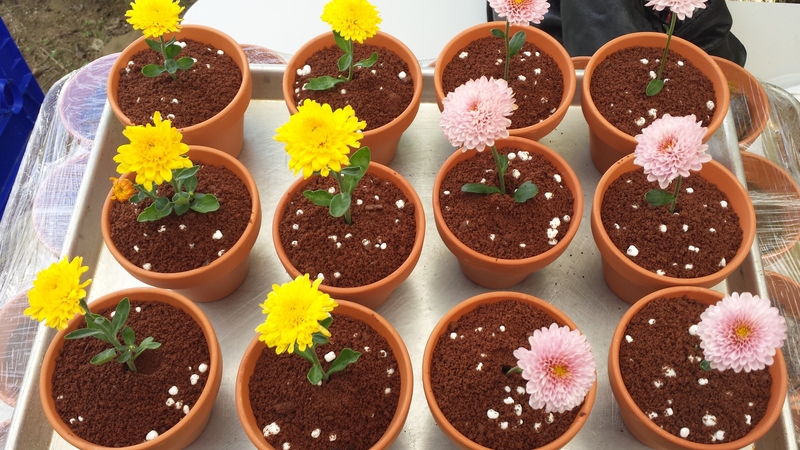 Celebrate Spring With Flower Pot Cakes – Here’s How to Make Them! Ok, so it’s not officially spring yet. But aren’t you dying for the spring flowers to come up? It’s that time of year when I really want something bright and green to take the place of all that dirty snow. Sure I can buy fresh flowers but how about using them to make something really spectacular for your family and friends. And this would be great for an Easter meal or spring celebration. Or a wedding! Aren’t these cute? I know it looks like a potted plant but I promise you it’s cake. I made these with gingerbread and dulce de leche between the layers. It’s topped with cookie crumbs and white Nerds (remember those candies?) 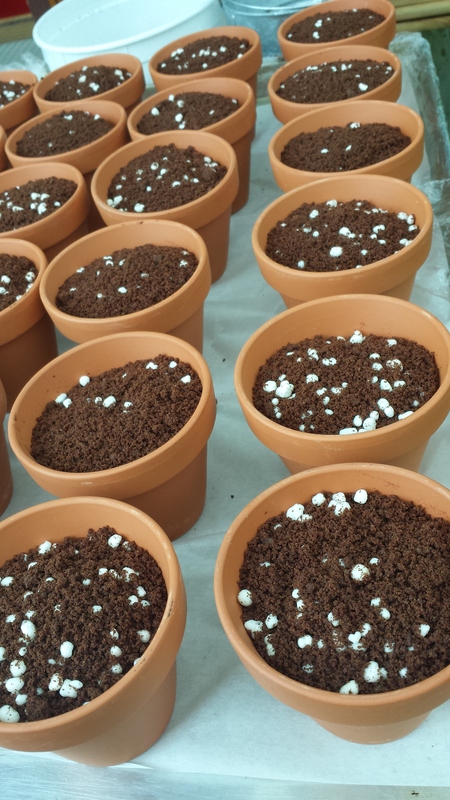 to look like potting soil. It’s super easy and you can use any flavor cake you want. You can add frosting or fillings or sauces between the layers. And, you can use any fresh flowers (or fake) that you like. Imagine these with pansies! Gerbera daisies! 1. Wash and dry terra cotta pots – even if they’re new. Pick the size or shape you want. 2. Bake a cake — any flavor. Cut pieces to fit into the pots: I used different sized round (biscuit) cutters to get rounds that fit exactly into the pots. 3. Make filling or frosting, if you’re using. 4. Add a layer of cake, top with filling, add another layer of cake; repeat until you’re inch and half from the top of the pot. 5. Smash or grind cookies until it looks like soil. It can be pretty fine but don’t mash into a paste. 6. Add Nerds to cookie dust. Add about 1/2 inch layer to the top of the cake. 7. Trim the bottom of the flower so that there’s about 1 1/2 inches of stem without leaves or branches. Rinse the stems thoroughly. 8. Push the flower into the center of the cake so that leaves and the blossom are above the cookie layer – so it looks like a potted flower. And that’s it! 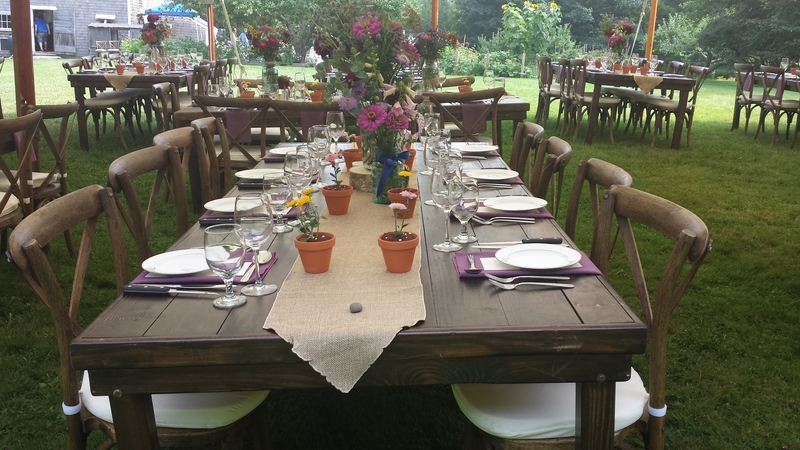 Be sure to check out our friends at Bread & Butter Catering! They catered the event in these photos and they created the beautiful settings.